The Perito Moreno National Park is located in the center-west of the province of Santa Cruz, in an environment that combines the inherent beauty Patagonian Steppes Forest and along the subregion of the High Andes. Encompassing 126,830 acres of pure nature, Nature Reserve was declared the May 11, 1937 and a National Park in 1945. Owner of the pure and fresh air that always dominates the fascinating region of Patagonia, Argentina, is an irresistible to plunge into a world filled with native beauties invitation. Located on the Andes, is complemented by blue lakes add their waters to the colors of these landscapes. Towering beech forests lining the Santa Cruz region and are transformed into the ideal habitat for endangered species: the hooded grebe; the South Andean deer; puma; and a variety of native fish and sweets as puyenes found shelter in this protected area. To know the full expression a varied offering that includes tours of different trails, discovering the presence of several gaps and challenging topography of the ground to meet face to face with the unique panoramic images offered by hills offers. Alternating walks and crossings to get to the most exciting corners. Within the estate several wild campsites invite to share a stay surrounded by these amazing landscapes are located. 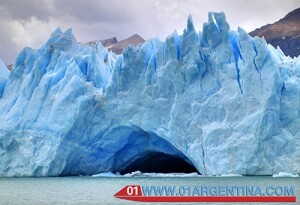 To get to the Perito Moreno National Park should take National Route No. 40 and then No. 37 Provincial Road. Imponentes, challenging, majestic, impressive, does not exist in any language can describe the word and perfectly complete this miracle of nature. 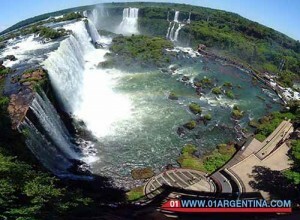 Iguazu Falls, located in the northwest corner of the province of Misiones, 17 miles from the city of Puerto Iguazú, is one of the most attractive natural privileges Argentina. Permanently visited by thousands of tourists who come to these soils from all parts of the world, proudly displayed their incomparable beauties offering visitors a wide range of activities to develop in annex territory. Iguazu Falls Image – Undersecretary of Tourism Province of Misiones Surrounded by a wild and rugged frame subtropical vegetation sprout Iguazu Falls 23 kilometers from the junction of the river, reaching heights ranging recklessly between 50 and 80 meters. Shared with neighboring Brazil, the inaccessible border is drawn on the fabulous Garganta del Diablo, the most important of the 275 waterfalls that fall miserably on countless waterfalls, dazzling the astonished looks and tempting risk. Modern and labyrinthine walkways allow discovering every corner of this paradise in the middle of missions, although it is still risky deep into the very Iguazu on boats specially prepared for this purpose. Adrenaline, vertigo and the most exciting sensations flood the soul in any of the paths they choose to take around Iguazu Falls, so it is advisable not to skip any of them ride and enjoy unrestricted freshness water and perfection of the landscape. The intense and exhausting journey, because of the humidity does not affect the thrill of experiencing this satisfying experience that will be saved in memory always demanding the desired repetition.